Home > TCG > Will Smite Tactics: Hand of the Gods stand out in the hyper-competitive digital TCG space? 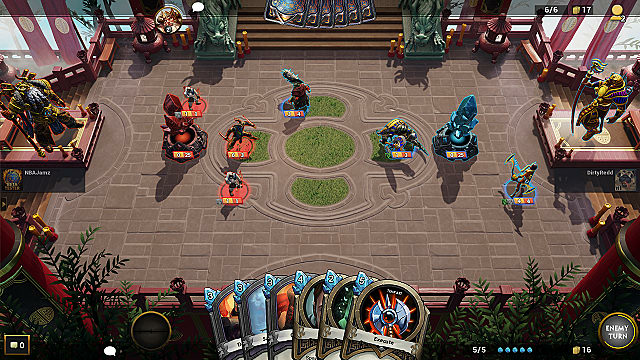 Will Smite Tactics: Hand of the Gods stand out in the hyper-competitive digital TCG space? Smite Tactics isn’t really a tactics game, which was disappointing right off the bat. It’s a pure-play digital trading card game, like Hearthstone, which represents the characters in the cards on a playfield as miniatures. It’s possible to move these characters around a small grid area, and that’s where the game gets away with calling itself a “tactics” game, but Final Fantasy Tactics or Fire Emblem (or even Fire Emblem Heroes) this is not. But as a fan of TCGs I quickly got over my disappointment to sink some time into Smite Tactics. There’s such a glut of digital TCGs now that actually standing out from the pack is a challenge, and while I’m not certain Smite Tactics has what it takes become the new standard for the genre, it’s still a quality and generally enjoyable game. So in Smite Tactics you’ll start out by building a deck of 25 cards, and these will be a mix of monsters to summon onto the battlefield, and spells to cast to either aid your side or harm the opponent. Naturally the more powerful spells cost more “mana” to use, and while you only start out with two mana points on your turn, each turn your pool of mana grows larger until you’re able to cast hulking beasts that cost six or seven mana points with no problem at all. 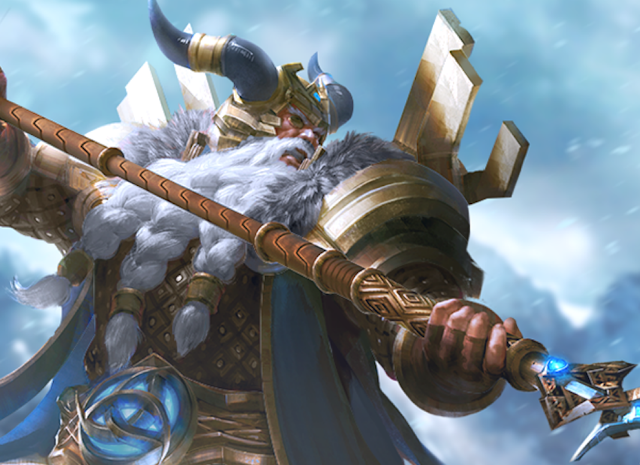 Like most TCGs, then, Smite Tactics is a game of escalation. Skirmishes will start small, with players using weak monsters and spells to try and maneuver themselves into a slight advantage so that, when the big beasts start to arrive, they’re able to roll over the opponent. The goal in each match of Smite Tactics is to reduce your opponent’s base to 0 health by attacking it with the aforementioned monsters. It’s nothing that you haven’t seen in TCGs before, and one of the biggest issues that I have with Smite Tactics at this stage is just how standard the whole game is. Monsters have two ratings - attack and defence, and occasionally have some basic abilities, like being invisible the turn they come onto the battlefield, or having a ranged attack, or being able to boost another character on the turn they are summoned. Spell effects are similarly basic - mostly reducing down to doing damage to an opponent or healing or boosting your own characters. The complexity of leading TCGs, like Magic the Gathering or Hearthstone, where you will carefully build decks of characters and spells that are complementary to one another, just isn’t present in Smite Tactics at this stage, so both deck-building between matches, and the strategy during the matches themselves, are too limited and not engaging enough for their own good, at this stage. Players can also choose between a range of “Gods.” You bring one into battle with you, and while they don’t participate in the conflict directly, each has a powerful special ability that they can use once per turn. My favourite is the God that can summon a weak zombie once per turn. Coupled with a deck of cheap characters, I’ve been able to win every match I’ve played so far by simply swamping the enemy with hordes of monsters before they have the time to start summoning their powerful creatures. There are no doubt counters to my strategy, but I get the sense that the Smite Tactics metagame is fairly limited to a couple of strategies so far, and if the developer would like to keep players longer it’s going to need to deepen the metagame. Because if there’s one thing that TCG fans like, it’s pouring over their cards to try and figure out what decks would beat out the popular decks that other people are playing with. As a free-to-play TCG game, there’s naturally a choice between grinding away for hours and hours to earn enough in-game credits to buy a pack of cards, or shelling over real money to get access to the cards quicker. Either way you’ll have enough to play from the outset, but naturally if you want the powerful cards you’ll be wanting those booster packs as frequently as possible. Time will tell if the game will slip completely into a “pay-to-win” model by essentially demanding that you've spent a lot of money to have cards that are powerful enough to be competitive. Smite itself managed to avoid that for the most part, so I’m hopeful it will be the case here too. Related reading: My thoughts on Smite on PlayStation 4. What the game does really well is get the visuals right. Monsters and environments are detailed and interesting. The game’s still in Beta, so there’s some odd bugs here and there, but for the most part it’s already a very slick looking production. Spells could use more impact - a spell that kills any enemy character, for example, is represented as a couple of glowing purple lines, and isn’t the most intimidating effect, but the way the monsters hack at one another makes up for this.